STANFIELD - The Stanfield Tigers ran into a tough competitor in the Elgin Huskies at noon on Saturday. Stanfield came a little slow in the second game with Elgin stretching the lead to 10-2. The Tigers battled back to being down 13-10. That's when Kristen Young came into serve for the Huskies and took them to a 19-10 lead. After a quick sideout to the Tigers the serve returned to the Huskies and Ashley Burgess. 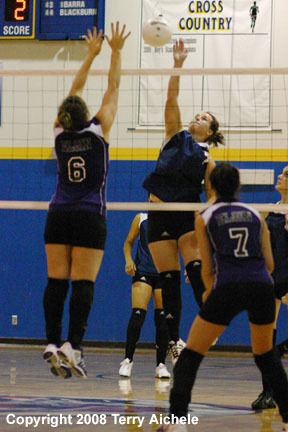 Burgess then served the Huskies to a 25-11 win. Stanfield took the early lead in the third game going out to a 5-3 lead. The teams remained close until the Huskies, with a long run of serve by Ashley Burgess, took the lead to 15-9. Elgin controlled the remainder of the game and took win with a 25-12 score. 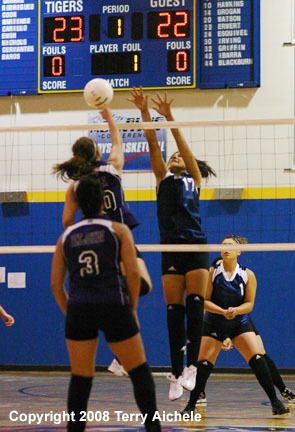 LEFT - Stanfield sophomore Alysa Sobotta goes up for a block against an Elgin player. 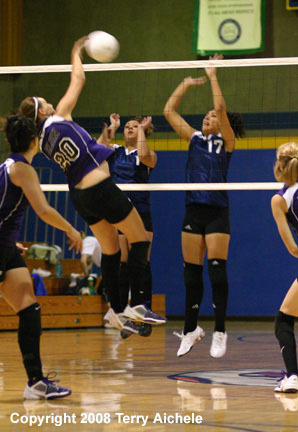 RIGHT - Erica Gehrke and Alysa Sobotta reaching for a defensive block of an Elgin spike. 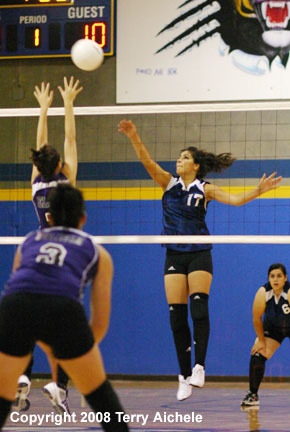 LEFT - Alysa Sobotta of Stanfield spikes the ball during the noon game against Elgin on Saturday. 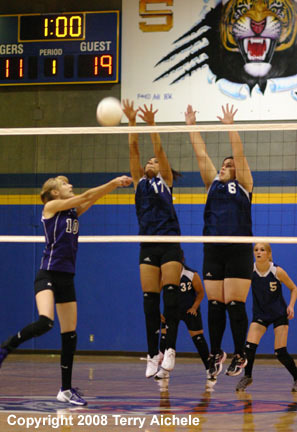 RIGHT - Jade Silver of Elgin bumps the ball towards Alysa Sobotta and Mikayla Baros of the Tigers. 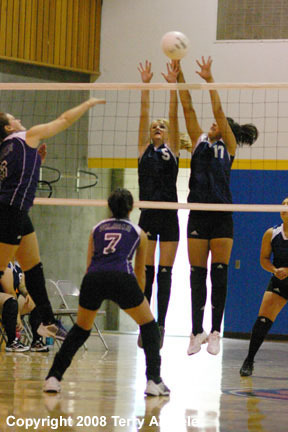 LEFT - Tara Ludwig of Elgin spikes the ball towards Jade Martinez and Alysa Sobotta. 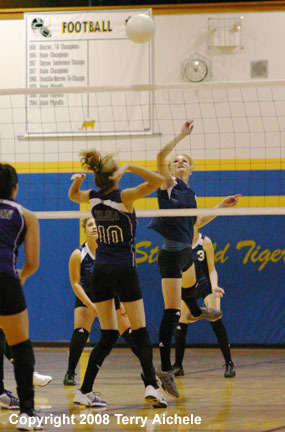 RIGHT - Erica Gehrke of Stanfield tips the ball towards Jade Silver of Elgin.